With the summer months upon us I can imagine that havelocks are a necessity on the battlefield. The front page print (of my June 29, 1861 issue) shows a woman making them for the soldiers. Not surprisingly there are many war-related prints on the inside pages, including a nice view of Camp Slifer & another showing troops marching from Chambersburg, Pennsylvania. 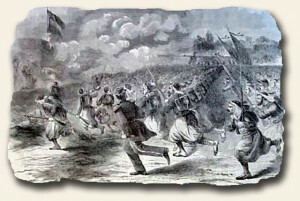 Movements of rebel troops are particularly interesting, and one of the prints shows rebel troops arriving & departing from Martinsburg, Virginia. 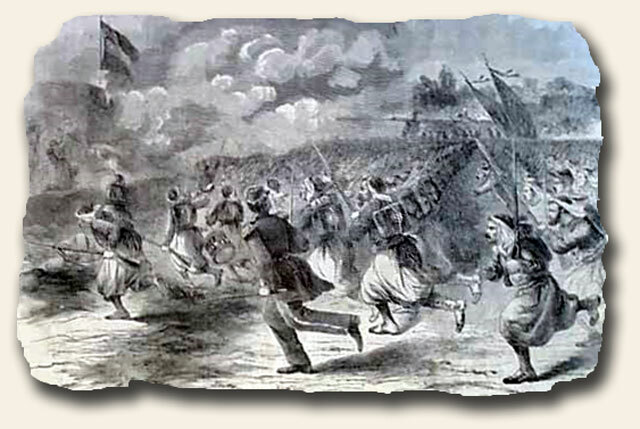 There is much drama in two full page battle scenes, both of the battle of Great Bethel but one showing the Zouaves soldier charging in their unusual uniforms. Another print shows the moat around Fortress Monroe–it is massive and must have been difficult to cross in the heat of battle.